MEXICO CITY (CNN) -- A moderately strong earthquake rocked Mexico City on Friday afternoon, shaking the earth in the sprawling capital. 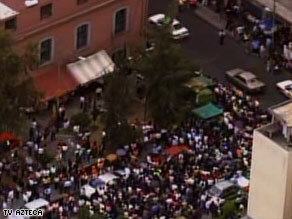 People in Mexico City stream into the street as a magnitude 5.7 earthquake hits. The U.S. Geological Survey measured the quake at magnitude 5.7, and placed the epicenter near the city of Puebla, about 85 miles southeast of Mexico City. It hit at 2:24 p.m. local time. The Mexican seismological service measured the quake at 5.9. People in the city reported the earth and buildings shaking. Thousands of panicked people streamed into the streets as stopped cars snarled traffic. Parts of the city were without electricity Friday afternoon but there were no immediate reports of injuries or damage. Earthquakes are a frightening experience for the 20 million residents of Mexico City, where thousands of people perished in a massive quake in 1985. The city, built on volcanic ash and clay, is particularly vulnerable to temblors. Aldo Pontecorvo of the humanitarian agency World Vision said the shaking lasted about 20 seconds. It came out of nowhere and "without any warning," said Pontecorvo, who said he was in his office when the quake struck. Earlier this month, a moderate earthquake was measured off the coast of Mexico's western Baja California peninsula.